I am a horrible baker. I have no feel for it, and I don’t like being unsuccessful when I screw up. It’s funny, because I think of myself as a competent cook. I like being in the kitchen but I find that cooking is so much more tangible than baking. I’m not great at following recipes. When I cook I can taste as I go along and my taste buds will tell me if I’m missing anything. In baking, I don’t realize I’ve missed something until I get to the end and my bread hasn’t risen, or my dough won’t form. I do know that I have it in myself to become a better baker. I realize that I just need to slow down when I’m putting the ingredients together and read the recipe carefully. I know with practice I will improve. I heard a friend had a killer pizza dough recipe that was easy to make, and delicious. Sounded good to me so I had the recipe emailed to me and it looked simple enough. Originally my thought was to make it in my Kitchen Aid mixer, (which has only been used a handful of times in 8 years) but I realized that in order for me to become a better baker, I should try to mix and knead the dough by hand to get the feel for it. The end result? Well, the dough never formed as I had imagined it should have even though I added more water than I was comfortable doing. The dough makes enough for 2 pizzas. On the first night, I forgot to put the pizza stone in the oven and ended up cooking on a baking sheet that I didn’t put low enough in the oven. I gave myself a C for this attempt. The dough was a bit undercooked and the toppings overcooked. The sauce was delicious though. I put the other ball of dough in the fridge and tried again the next night. With the knowledge of the results from the night before, I put the preheated the pizza stone in the oven on the lowest rack. I also just put the pizza sauce, meat and onions on my pizza for the first 7 minutes and then threw the cheese, and basil on for the last couple of minutes. I also put some arugula on after I took it out of the oven because I felt I needed some greens. Result? It was really good. I was starving when I made this and ate most of it out of the oven before I remembered to take a photo. 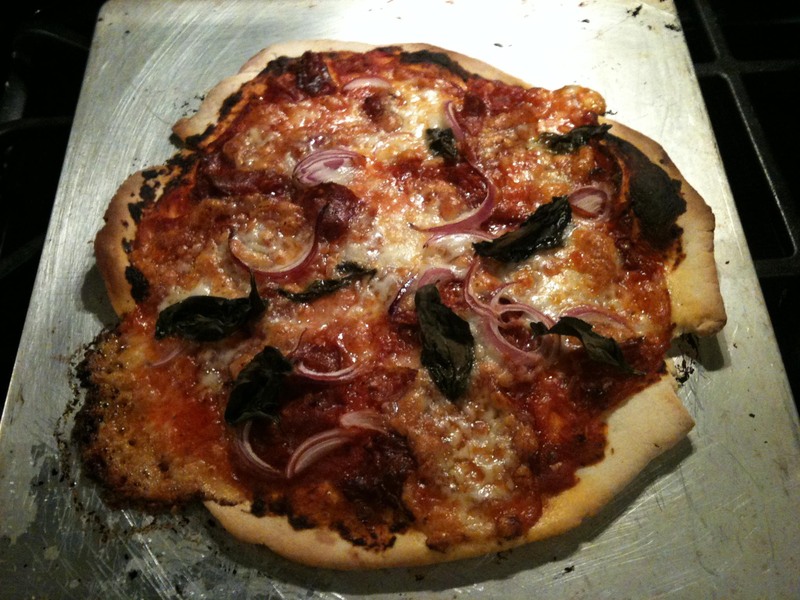 I call this post Part 1, because I know I’ll be making pizza again soon and will document the process a bit better. 1) By hand: Stir together 1/3-cup water and the sugar in a large bowl. Sprinkle the yeast over this mixture and let it stand until it is foamy, about 10 minutes. Stir in the remaining 1/3-cup water, olive oil and 2 cups flour and salt. Blend with a large spoon until the contents form dough. Knead the dough on a floured surface, incorporating more flour if necessary, to keep the dough from sticking. Knead the dough until it is smooth and elastic, about 5 minutes (my dough never became smooth nor elastic, at a certain point, I thought “good enough”). 2) Put the dough into a deep, oiled bowl, and turn to coat it with the oil. Let the dough rise, covered with plastic wrap in a warm place for 1-2 hour or until it is doubled in bulk. Punch down the dough and form it into two balls. Each will make a large pizza. Can be refrigerated for 3-4 days. If so, let rest until room temp before rolling out. Bake at 500 degrees for about 10 minutes. Exquisite Pizza Sauce – taken from Allrecipes.com and modified to taste. Combine ingredients in a bowl and let sit for 30 minutes. In regards to the amount of water, it really depends on the type of flour. With practice you’ll get the consistency down, and you will begin to know how much flour/water to add just by the feel of the dough. 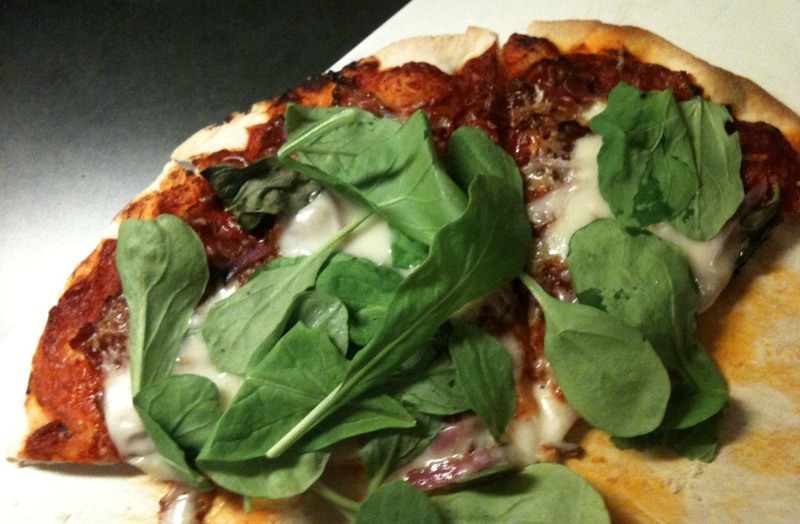 Your pizza looks delicious, great choices for toppings! I just got a great sounding Foccacia bread recipe from a friend, I’ll give it a try and send it your way if your up for another baking challenge. I’m going to add a caramelized onion sundried tomato topping. Thanks Max! The 2nd pizza was delicious, and I will try again soon. The Foccacia sounds great, please pass along the recipe if it works for you, I need challenges!